This is the shocking moment more than 40 cyclists ride through a red light in barely 20 seconds. The 45 year-old male cyclist who suffered serious head injuries was taken to hospital by London Air Ambulance. Olympic champion Sir Chris Hoy has told ITV News that more needs to be done to improve cycle safety in the capital. The six-time gold medallist spoke at the London Bike Show at the Excel Centre - where 50,000 cycling fans were expected to attend over the weekend. The 39-year-old's comments on road safety come after it was revealed that three times as many people are now commuting to work on bikes, compared to 15 years ago. A female cyclist is in hospital after colliding with a lorry at Blackfriars Bridge this morning. The woman, who is believed to be in her 20s, was treated at the scene by paramedics at around 10am. On Saturday a woman in her 50s was left in a critical condition after her bike and a van crashed near the Airman pub in Hanworth Road, Feltham, in west London. Around 500 cyclists are expected to stage a protest at Bank today after a woman died after being hit by a tipper truck in the area earlier this month - marking the eighth cyclist fatality in the capital this year. Police were called by LAS to Previous Southwark Street junction with Blackfriars Road, SE1 at approximately 09:59 hours following a report of a collision involving a lorry and a cyclist. The female cyclist believed to be in her 20s has been taken to hospital with non life threatening injuries. 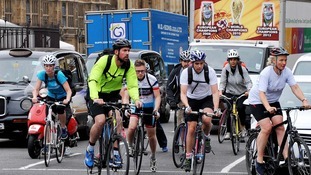 Five hundred cyclists are expected to carry out a vigil and protest at Bank junction on Monday. The demonstration will mark the deaths of Clifton James and Ying Tao, the seventh and eighth people to be killed while cycling on London's streets this year. The campaign group Stop Killing Cyclists is calling for changes to make London roads safer for cyclists and pedestrians.The changes they want to see include the closure of Bank junction to cars and other vehicles, and a ban on tipper trucks in central London during morning and evening rush hours. 60 year old Clifton James and 26 year old Ying Tao will be remembered at the vigil. Clifton James was killed cycling near his home in Harrow after midnight on the 21st of June and Ying Tao died after being hit by a lorry at Bank on the 22nd of June. Campaigners for safe cycling in London are holding a flash protest outside Bank station this morning. It follows the death of 26-year-old Ying Tao near the Bank of England earlier this week. She is the eighth cyclist to die on the capital's roads this year. The London Cycling Campaign is calling for more safe routes across the capital. More than 1,000 people are expected to take part in the World Naked Bike Ride when it returns to the streets of London later today. The ride, which aims to raise awareness of cycling safety issues, will start from six different points around the capital this afternoon. These include West Norwood, Tower Hill, Kings Cross, Regent's Park and Hyde Park. New technology to detect the number of cyclists at major junctions and adjust traffic signals accordingly is being tested in London. A cyclist who traced his stolen £4,500 custom built bike to Spain has been reunited with his ride via social media. 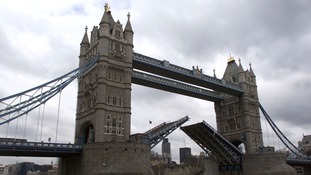 A cyclist is seriously injured in hospital after a crash on Tower Bridge. The 25 year old man collided with a mini and was found lying in the road by police around 3.45 this morning. He was taken to a hospital in East London for treatment and police say his condition is serious but not thought to be life threatening. The bridge was shut to traffic throughout rush hour and has since reopened - but serious delays are continuing and drivers are being warned to avoid the area if at all possible. Three cyclists have been killed so far on London's roads this year. The latest victim has now been named by police as 26 year old Frederica Baldassa. She was killed in a collision with a truck on Bloomsbury Square in central London on Friday evening.